Are Amazon’s Warehouses Equivalent to Modern Day Sweatshops? 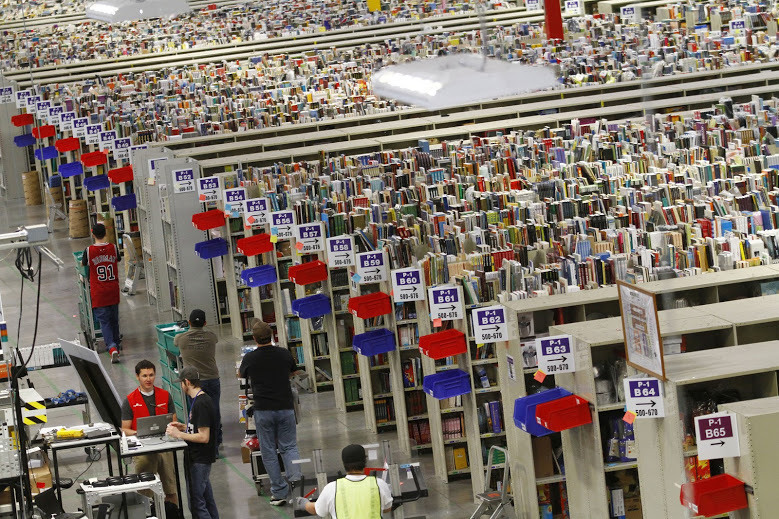 Numerous photos, such as this one, inside an Amazon warehouse were widely circulated on the Web earlier this year. 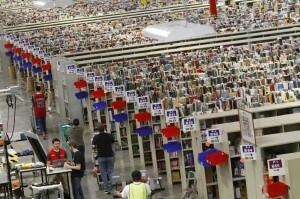 It appears that Amazon’s warehouses are the global book distribution chain’s equivalent of modern day sweatshops. Earlier this week Amazon fired its German security firm after a documentary film crew from ARD tied it to a far right wing group. The film crew revealed that seasonal workers hired by an Amazon subcontractor in Germany, many of whom were previously unemployed, were driven around Germany in buses, housed in poor conditions and kept under constant surveillance by the aforementioned security guards. On their arrival in Germany the temps were allegedly housed several to a cabin at a vacant holiday park where they were dependent on unreliable and overcrowded bus services. The workers were monitored by a security company called Hensel European Security Services, whose initials, the programme pointed out, spell out the surname of Hitler’s deputy, Rudolf Hess. This follows a thorough Financial Times report that documented the numerous complaints of Amazon warehouse workers in the UK, which included being issued cheap, ill-fitting footwear and being required to walk between 7 and 15 miles per day. The FT studied Amazon’s labor practices, as well as broken promises. In 2011, “an Amazon official told a parliamentary committee the company employed about 15,000 people,” but according to 2011 accounts, Amazon averaged just 3,023 employees. And many of Amazon’s employees are temps with no benefits or long-term prospects with the company. Talk about bait-and-switch. Push comes to shove. Interesting turn of phrase, particularly in the context of the trouble in Germany. A widely published critic and essayist, Edward Nawotka serves as a speaker, educator and consultant for institutions and businesses involved in the global publishing and content industries. He was also editor-in-chief of Publishing Perspectives since the launch of the publication in 2009 until January 2016.